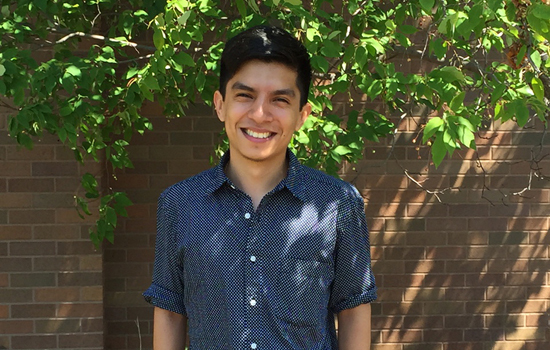 Christian Gordillo is a fourth-year biotechnology and molecular bioscience major in RIT’s Thomas H. Gosnell School of Life Sciences and a member of the Louis Stokes Alliance for Minority Participation (LSAMP) program. He hails from Queens, N.Y., and as a first-generation American who speaks fluent Spanish and English, will be the first in his family to graduate from high school and college. His goal is to become a medical doctor. Answer: I’ve gone from the arts to science. In high school I was interested in architecture and culture. But at RIT, I started in psychology and then switched to bioscience because my overall goal is to become a doctor. Q: What do you enjoy best about the biotechnology and molecular bioscience program? A: I’m a hands-on person and I really like lab work because there’s so much to learn. Plus science is such an evolving field. And hopefully through the kinds of research we do at RIT, we will help find cures for certain kinds of cancer and other diseases. A: LSAMP is offered through RIT’s Office of Diversity and Inclusion and helps students from underrepresented populations enrolled in STEM fields. It is similar to the McNair Scholars program where you get support and funds to do intensive research. Q: What did you work on during your summer research? A: I have an internship with Professor Irene Evans who has been testing targeted molecular-imaging agents that Professor Hans Schmitthenner makes to help detect early stages of prostate cancer. We look at the cells under a confocal fluorescent microscope. Working with her, I knew it was all about the patients being tested for this disease, but it was also about having patience. She emphasizes how things can go wrong, and also how things can go right. That’s science. A: It’s about loving what you do, and I have found that RIT is a great place to be because there are so many choices in classes and curriculum to keep you interested. It’s also a place that celebrates heritage and culture, where individuals are encouraged to keep their traditions and that’s a big part of my life. I deeply thank my parents who emigrated from Mexico and gave me the foundation for this wonderful opportunity. Q: Do you have advice for other students? A: Don’t overload with classes to get ahead. You will have a difficult time keeping up with the workload, a job if you have one, and other commitments like sports or clubs on campus. My advice is to get involved because you will learn about real life from the people you meet and the students who come from all over the world. I don’t regret coming here at all, except for winter and the cold.